6000 watt pure sine wave power inverter works with maximum efficiency towards most of the electronic devices at home or outdoors, with over voltage, low voltage, overload, short circuit, overheat, polarity reverse protection. 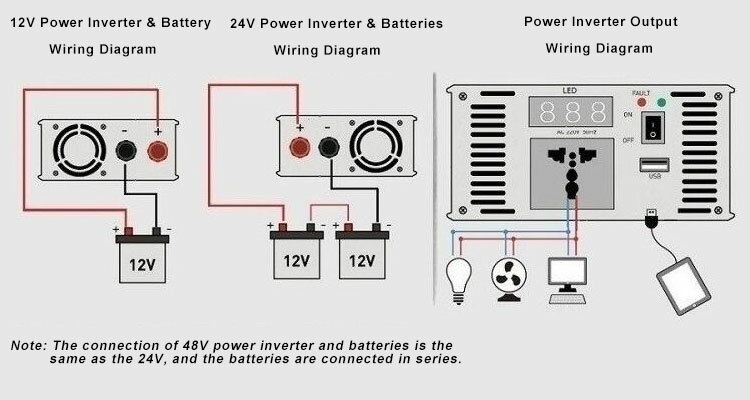 Tips: How to equip the battery with a suitable power inverter? If a battery is 12V/50AH, we can obtain a battery output power of 600 watts via multiplying 12V by 50AH. If the inverter efficiency is 90%, then we multiply 90% by 600 watts to get 540 watts. This means that your battery can drive an inverter with an output power of up to 540 watts. Of course, you can also take a "one-step" purchasing method, that is, to buy an inverter with an output power of 800 watts, regardless of the specifications of the battery used in your car. Then, use it within the allowable range of this battery at the moment, and perhaps change a new car to use it at full power afterwards. If your requirement for the inverter power is not high, for example, 100 watts is enough, you can buy a low-power inverter. In addition, when determining the power of the inverter, there is an important principle, that is, do not run for a long time at full load when using the inverter; otherwise it will greatly shorten the life of the inverter. At the same time, the failure rate of the inverter will also be significant rise. It is strongly recommended that users use inverters that do not exceed 85% of rated power.